Here’s Sheldon Richman’s brilliant article on our warmongering politicians – Senators John Kerry, John McCain and Joe LIEberman are banging the drums, calling for a war against a country that is not a threat nor has attacked the United States (although the US has bombed Libya before and even killed Gaddafi’s adopted daughter). But the US military doesn’t seem too eager to rush into another war. If Kerry and McCain want to bomb Libya – they will need to fly the planes themselves. Please call, write and email your elected representatives in the House and Senate and the President that another war is not in the best interests of America, especially at a time when several wars are already a huge drain on the economy and impoverishing the country. 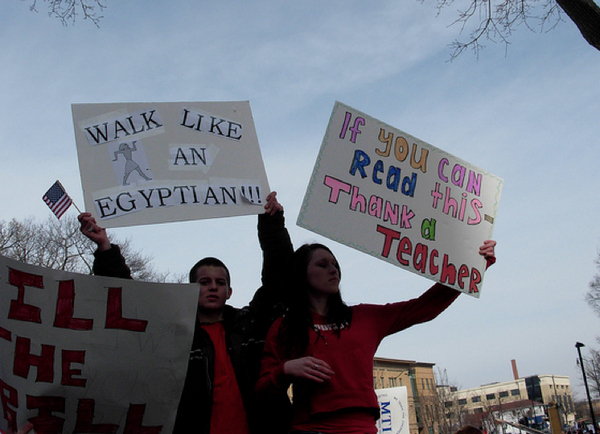 I was amazed to see “Walk like an Egyptian” signs being held up by the Wisconsin demonstrators. They have it all wrong! Egypt and Wisconsin are not the same. The fight in Wisconsin is not a fight for liberty like in Egypt, Tunisia, Libya, Bahrain, etc. In fact, the complete opposite – It is a fight to enslave Americans further under excessive taxation. It is a fight on how to divide the spoils of taxation. Americans have lost their spirit they had that freed this nation. The founding fathers revolted against the British because they were being charged 10% tax by the British. Today they revolt to further enslavement as in Wisconsin. “In Wisconsin, as in Greece, the welfare-state chickens are coming home to roost. The state’s revenues are insufficient to pay the bills. State officials, who lack the constitutional authority to simply print money to pay the bills, are having to slash spending, which has sent those who receive the state’s largess on the warpath. “Don’t take away our dole,” they cry. Meet Asma Mahfouz, the 26 year old Egyptian woman who started a revolution.